Here you will find letters from previous clients. Here are a few letters and pics of past Doodles! To all the families for sending there update letters ! Hi Jamie sorry it took so long to email an update but I wanted to include proof of spay with it. Ruby is from Skiddles and Oscars litter and was born December 16th. Ruby has fit into our family wonderfully. She really has been nothing short of amazing. I attended basic obedience classes with Ruby and I think it definitely helped. She is incredibly smart, was potty trained in no time as well as crate trained very quickly. She's amazing with our two young daughters and truly believes those are her 2 sisters lol. We have a cottage and have enjoyed numerous weekends there with Ruby. Her behavior there has been great and everyone loves her there. The one pic is of her playing at the cottage with another standard size doodle, which is her best friend. When I would read testimonials saying people would approach them about their golden doodle I didn't believe it at first. After experiencing it first hand I now see what they meant. People constantly approach us to compliment us on Ruby and ask where we got her. I of course tell them Dreamdoodles is the best! We are still working on Ruby's jumping when people come over but that's slowly coming and she is still young. Besides that she's been an absolute dream. Thank you Jamie. from Matt, Shannon, Leah, Lucy and Ruby. As first-time dog owners, we didn’t really fully know what we were getting ourselves into, and luckily Maple has been such a joy to have around! He’s been so easy to train (he does sit, lie down, down/off, stay, paw, other paw, touch, and spin) and his cuteness makes everyone constantly smile. He has an amazing temperament and has been the perfect fit for our active/busy life. We are so happy to have chosen him to join our family. My name is Sarah Conway, my parents are Scott and Sam. Our family has been meaning to email you for quite some time now. About 8 years ago, on February 22nd, our baby Oscar was born! He was an F1 Standard Goldendoodle. Oscar has exceeded our expectations and has truly been the best dog ever. He is a mellow but goofy guy, always putting a smile on everyone's face. Whenever we go out for walks, people have to pet him. We often have people say some pretty hilarious comments. Just yesterday, some lady shouted "holy ball of fluff" across the walkway at us. Oscar has such a loving personality and is the best cuddlier (seriously, he sleeps in bed with me every night). He is especially fond of our cat and lays in bed licking her ears. I wanted to check in and thank you. Our family is so grateful to have Oscar, we love him with all our hearts! I cannot adequately express what a wonderful part of the family he is. Charlee and Tori are doing great!!! Charlee is such a sweet lovable - goof! She is so much like a big stuffed animal. You can't help but smile when you see her! She is very friendly, loves all the customers that come in, and she just rolls right over for her favorite - a belly rub. She is so laid back, that the joke around here is that "we can't wait till she's two and she calms down!" She is a "talker", which I absolutely love, - it sounded like she said "mama" yesterday! She loves to be around people, and will only bark if I leave the office, or if someone has her toy - doesn't like to share! She loves to run in our yard, and play ball, go for rides in the car, in fact she will go and get her leash. The pictures I'm sending were about 6 weeks ago, and she was about 35 lbs then. She is scheduled for her spay at the end of the month, so I'll have more info for you then. and will bark when she is startled or is running with all the dogs in our big back yard. She loves to cuddle, and is a really big kisser! She has very long eye lashes, and will look at you and I believe flirt with you when you have to scold her. Charlee just looks at you like - what are you talking to me? Tori is very smart, and will learn things very quickly. She is really good at the "high-five", and when we were trying to teach it to Charlee, would come over as if to say "like this stupid!!!" It is a challenge to teach things when four of them are all competing!!! she is fine as long as they are not in her face - mainly Tori, because she just wants to play and lick her face. I also think with Tori being of same color and size, poor Bailey just can't figure out why we needed her! Otherwise when they are all out for a walk, playing or all just lay around together and it's really cute. Avery is our 22 month Black Lab, she loves having Charlee and Tori, as they all play and wrestle and take snuggly naps together. She is my sons hunting dog, and still thinks she is a little puppy! Please remember that if you should decide to put Brooke up for adoption, we could still be interested in having her. I'll send more later. Hope all is going well. We have many inquiries about these dogs, and we send people looking your way!!! I know it has been quite some time, but I just had to write about what a wonderful addition Molly has been to our family. Everywhere I take Molly (on walks, outings, in the car) I am guaranteed to be stopped at least once with What a beautiful dog! What type of dog is she? at which point Molly greets this person with a big smile, full body wag, and if Im not quick enough a *kiss*. and the children in the adjoining backyards all love Molly and take trips over to see and play with her regularly (not to mention the parents). She is a well-known facet at the dog park, the other owners always comment how fast and playful she is (after they say the comments above). so she follows me everywhere, and she just loves her early morning snuggles when we are both shaking off the cobwebs. but if you have you may want to ask if a little black golden doodle named Molly is who directed them to you! Molly ended up about 22lb with a lovely soft coat, and a wonderful temperament and personality. and is so good they give me a significant discount keeping her as she feels like part of their family. Anyway- I included some photos for you, and have MANY more, even better ones, on my home computer if you would like some. Feel free to post this letter and any pictures on your website if you think it would be applicable! Thanks again for such a wonderful addition to my family. Just wanted to keep in touch and update you about our puppy. We named her Sofie. She is quite the personality; very smart, sometimes quite feisty, but always happy and loving. She loves the snow! Thank goodness, because weve had a lot this winter. We are thoroughly enjoying her. She was spayed a few days ago; do you need to see anything about that? She is now 16 lbs. I have also attached a few pics  some when she was about 10 weeks old and some recent ones as a 4 mo. old. Sharon, Tom and Cooper here. Cooper is such a great boy. Hes 21 lbs and all legs and fur. wants to know where to find a cute golden doodle. had any luck finding it and I myself couldnt find it just now. Has something changed with your address? we are all in love with each other! We traveled the California coast at Christmas where Cooper was a huge hit at all the dog friendly establishments. Hes 48lbs of joy. Did I read right that you are now only breeding mini golden doodles? Also , are there any photos up on your site of any of his litter mates from Chelsea and Cruiser circa Dec 05? Today is Coopers 4th B-day and we always think of you and Chelsea and Cruiser and how grateful we are for our healthy and happy beloved boy. He is so easy to live with and brings us such joy. Thank you for bringing him into the world and into our lives. Lola and Franky Goldendoodle Puppy! This is our Zeus Bossio which we purchased from you August 2008. Zeus was born June 9th 2008 from Frankie and Lola. I sit in my lazyboy chair for my coffee in the morning, Zeus is sure to plop on beside me even though I am squished to a "t". He is so funny and so incredibly sweet, I wish I could get another one but it's obviously in the city I live in a bit much to handle. We love our Zeus and wanted to share his photo. He is now 1 1/2 years old. Thanks for your business Jamie. I am sending proof of Ollie's neutering. He is a great puppy, we absolutely adore him! I feel like he was created just for our family, he fits in so well. more not including ours at our daughters. puppy in a few days. Thanks again for such a wonderful puppy! I am sending you confirmation that Cheerio has been spayed and she is doing very well. She is 20 pounds exactly right now at 6 months old. The kids absolutely love her and she loves them. I have attached a couple of pictures for you from the time we brought her home up to now. I want to thank you so much for everything. I have passed your website to quite a bit of people. Cheerio is like a walking advertisement. People always ask what kind of dog she is and where did we get her. She loves the attention to. I hope all is well and I can't wait to see how she likes the snow! Just wanted to check in to give you an update on how Buddy is doing. He's had all of his shots, and is doing great in Puppy school (he's in a group with a bunch of Retrievers and Labs, and I have to admit, he is the cutest of all of them!). He is just under 17lbs now, and keeps on growing! He is sooo lovable and friendly, and super hyper! He's teeth have begun to fall out, which is a good sign that we should be able to neuter him in a few months. He also doesn't shed, which is even more of a bonus! I've attached a couple of pictures - one at 10 weeks which is adorable, one at 16 weeks where he is posing for the camera, and one of him with his favourite frisbee (also taken a 16 weeks). On Sunday even though it was pouring rain and very windy we went to the parade with Marley. - in the parade there were horses, dogs, clowns, floats, etc. her and she acted like she usually does - like a great puppy. Walking up the street to the parade, a group of teenagers yelled out "what a beautiful dog". She certainly made us proud and we want to thank you once again for such a wonderful puppy. Marley is 8 months old and has brought such happiness to our home. back he will be in touch with you - he is thinking of getting a pup just like Marley. Hope all is well...from your website it appears you have been busy! and we are working on the next level. He weighs about 20 lbs and we hope he stops there...just the perfect size. stay dry...we have a pool and he likes to swim! glad we did it...it is nice to see his beautiful eyes! She weighs in at 24.7 pounds. She is very active yet can sit with us for hours doing nothing. She runs 5 KM. with my husband every other morning. She goes to the park and runs flat out to retrieve her ball. She runs with the other dogs in the park, but prefers to retrieve the ball, if she can't find a dog that will chase her. Since she is running early in the morning dew, she tends to come back with muddy paws. I told her not to jump on the bed one morning after her run because she had dirty paws. She raced two flights downstairs. We found her standing in the laundry tub. We now just have to say, " You have a dirty face or dirty paws and she will jump in the laundry tub and wait for us to hose off the dirt. She seems to understand quite a few words that are not dog commands. Riley is very affectionate and loves everyone to the extreme. We plan on making a trip to the east coast this year. We will take Riley since she loves the car and travels well. Thanks again for the affectionate, non-aggressive, smart dog. I know the mini will be a huge success. Many current standard goldendoodle owners have told me that they will buy a miniature doodle next time. I have been wanting to send this out to you for soooo long. I wanted to say a great big huge THANK YOU for breeding such a wonderful dog. We bought Ranger in July, 2003. He has been the most incredible addition to our family, the Irwins, Bob, Barb, Meg, Robbie and Katie. Ranger has been an exceptional dog. You have recently sold at least two of Rangers brothers or sisters to people we know. And two more are on the way. Ranger sells himself. I cannot even begin to tell you how he has made our family so complete. He is our pet, our dog, our great friend and deepest love. He is terribly adorable, and when we walk him, many people have asked us what kind of dog he is. It has come to the point that we literally carry around your name and phone number for these people(a little commission please). We know that the Howitt's are picking their puppy Jazz(Jasmine) up next week I believe. Another aquaintance bought one on this past Friday, and a soccer Mom and Dad who we are aquainted with are considering 2 doodles from you. True to your word, Rangers temperament has been exceptional. He has not shed, and myself or Meg have had no reaction at all. He is our U10 Waterloo Soccer team mascot, officially. He attends most games, and High 5's the girls when the game is done. He was easy to train and continues to amaze us. He has been referred to as "a little boy in a dog's body". I have been asked by a local trainer to consider him as a Therapy, which I probably will do. Ranger goes to Puppy DayCare once a week to socialize and play with his dog pals. They LOVE him there, and have seen some terrible doodle breeds but have nothing but wonderful things to say about your breeding abilities. When any clients inquire about doodles, they refer them to me and I give them your number. GOOD ON YOU for breeding an exceptional hybrid. We LOVE Ranger to death, and cannot recall life without him. He is beautiful, loving, sweet, and has very good manners, as I am told. He enjoys "sleepovers" with his girlfriend now and then too! Jamie, keep up the great work, and we'll continue telling people about you! We have also ourselves seen some other doodles and they can't hold a candle to Ranger. Our vet was duly impressed!! I'll gather some photos, and if you'd like me to write as referral letter for your website, you can count on me. I realize we are way over due in thanking you, but we do, from the bottom of our hearts, thank you for Ranger, the love of the Irwin family! Barb Irwin, Bob, Meg, Robbie, Katie, and Ranger, son of Clancey and Fozzie! Ranger is still the love of our lives and a big part of our family. He is well known to many in our large city, and we have people asking about him all the time. I have sent many people your way, and they have all fallen in love with their doodles! One more may be on her way to you soon enough. Keep up the great work. I have attached 3 updates of Ranger. Just thought I would give you an update on Maxwell. He is from Pixie and Frankie's litter July /07. Maxwell is lots of fun and a great companion. He loves to snuggle and go for long walks. He has figured out how to open the dresser drawers to help himself to my lingerie. He is a very popular fellow and my coworkers refer to him as the muppet. Thanks so much Jamie ! I am attaching a couple of pictures for you. This is an updated picture of Aggie in Fredericton, NB. She is Sisco and Paige's puppy #4. She is now 12 weeks old and 10 lbs. We love her! Using my Mom's computor to send you pictures of our baby, Reesy, at about 8 mos. just before her first teddy bear haircut. Her coat is long and wavy and never sheds. She is very smart, full of energy and has been easy to train. She is very friendly with new people and gets along well with any other dog. She is the perfect sales dog for the Goldendoodle breed. We absolutely love her ! Hi Jamie. Just writing to give you an update on our little Crosby, born September 3, 2007 to Faith and Franky. We have attached a picture of our kids with our little pooch. It has been two weeks since we have picked Crosby up and he is absolutely the best. He is being crate trained, which he has made really easy for us since he loves his bed. Housetraining is becoming easier by the day as now he has learned to go to the door when he has to go potty. He is brillant! He knows to go to his bed, his pillow, fetch his bone. You would not even know we had a dog until you saw his belongings. He has barked twice and only at his toy. He has a great temperment and personality. He is actually quite funny. We have fallen in love with him. Crosby loves to play...especially with our six year old son, Matthew who he thinks is a big toy! He's very gentle when he plays and is a great addition to our family. It was a pleasure being in contact with you. 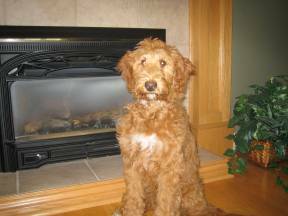 You are a fabulous breeder and I would recommend you to anyone interested in a miniature goldendoodle. Thank you. Wishing you a very happy holiday season and a new year filled with good health and happiness. It is so nice to hear from you. Your ears must have been ringing, because I have had several conversations recently about how I need to contact you and let you know how happy our whole family is with Jersey. She is such a blessing. Everyone that comes around her is in ahhh over her intelligence, behavior, and appearance. Within the first couple weeks she was obeying simple commands: sit, lay, fetch, drop (the ball). She still sleeps in her crate, which is located in our room, but she knows that until we say "time for bed" she gets to lay with us enjoying pampered time with mom and dad. She rarely barks. Only when a stranger comes in, until we say "it's OK" and when she gets really involved in playing. This made potty training interesting for the first couple months, but then we got wise and put a bell on the back door and since then we have had no accidents! Hurray!!! It was so much easier then we expected. The boys love playing with her. Every once in a while they get a little rough and we have to watch them, but Jersey has been awesome, taking it all in stride. She is inside with us most of the time, however she does love her walks, playing fetch and chasing after the boys in our back yard. Her favorite spot to lay is where ever you are, and the back of the couch is definitely hers. She has no problem with kicking back and relaxing. Her coloring is exactly what I wanted and I love her soft hair. Best of all, we have had no shedding and my allergies have not been a problem at all! She is currently 8 1/2 months old, 16 inches tall, and 18 lbs. The perfect indoor dog. We couldn't ask for anything more. Jersey stayed a few days with my parents and they just fell in love with her. They may be contacting you, along with a couple of my close friends, and a neighbor of ours. Attached are some pictures of Jersey as she has grown. We will continue to keep in contact and thank you again for such a precious gift. Jersey Mini Goldendoodle at 8½ months! Well, Ranger is 3 and a half years old and still the love of our lives. He never ceases to amaze us and is a joy all day long. Attached is an updated photo to accompany our letter on your website. Charlie went to the vet on Thursday and got fixed. He is so sweet and loving and did great through the whole thing and is back to his usual self. He is now up to 25 lbs, which I was surprise to hear...thought he was bigger than that. He is the best dog and so happy. (bc her dog is allowed)! He had a fun trip to the country. My mom is very interested in a one of the toys...she may be in touch. Hope all is well in Canada! letter if you want. Thank you for breeding the best family pet ever. Merry xmas! i am just letting you know how well kya is doing. she is a smart dog. she finished puppy school that taught her the basics. i then taught her to "go to your mat" "go to bed" fetch your kong" then i put her dog food in it. "look at me" "off, wait take it" "rollover" "shake a paw" "heel" "fetch your ball and drop it" well i could go on but i do have one problem with her that i just can't fix. whenever someone comes to the home she goes ballistic! she jumps up and when i tell her to sit sometimes she does but just for one second and then she is all over the person again. if i tell her down she gets so excited she shakes and rolls over on her back and then she is up again at them. she knows "down stay" and "sit stay" but there is no way is could do it when people are here. do you have any suggestions. hope to hear from you soon. Rogan had a great ride home, very settled, no accidents or sickness. that this is his home. when he is in the house. well at night and has been able to hold until Dave gets up around 5:30.
late I take him out. He is a gem and all my friends and the kids friends are so taken by him. sitting duties lighten up a little. From the moment we brought her home she has been such a joy. graduated with ease from her puppy classes. The children adore her, and so does everyone else. about goldendoodles and where they can find a good breeder. has seen and she is so good to work with. find the perfect dog, and we know she was well worth the wait. Thank you for bringing him into our lives! He is a joy! quickly he has grown! He is right around 22 lbs. not sure what the cost would be? Can you please advise? This is Mini Goldendoodle Toby! Just wanted to send you some photos as well as give you an update on how Toby (from Bonnie & Romeo's litter) is doing. He is now 4.5 months old and around 14 lbs. The housetraining is going great and he is loving the recent snow we've been getting. When he hears a dog barking on TV, he will start barking as well. He does experience motion sickness on car rides, but hopefully that will get better over time. Other than that, Toby is doing great! I was wondering, if you're not too busy, could you forward me the contact information of Toby's littermates? I think it would be nice if we could exchange updates and photos with one another. If you'd rather forward my contact info over to them, that is fine too. Thanks for such a wonderful puppy! He is a bit darker than he appears in these pictures. was nice to hear from you. Here are some pics of Quincy. He is very hairy at the moment, but will be having another cut on Thursday. I will send more after he gets clipped. Quincy is a very good boy, and has been a great fit with our family and other dog Penny(a labradoodle). He has a wonderful disposition and is very calm, everywhere I take him people are amazed at how relaxed he is in busy settings. People are always asking where they can get a dog like him, so I have been telling them about your website. We were wondering who Quincy's parents are? They certainly produced a wonderful pup, we will miss him when he goes for his final training in 8 or so months. Id just like to give you an update on Quincy, Christie and Siscos pup. He will be celebrating his 1st birthday on March 18! He has grown into such a beautiful dog. He is a gentle soul who doesnt have an aggressive bone in his body. He is smart but can be stubborn some days! He had a wonderful winter and thoroughly enjoyed the snow. He spent a lot of time burying himself in the snow banks, chasing snowflakes and played for hours outside with the kids. He loves to cuddle and although he is 45 pounds of fluff still enjoys sitting on mommys lap. Our lives have changed tremendously having him and we are thankful for every kiss and tail wag we get. I just wanted to let you know how our one year old Sunny is doing. As you can see from the pictures he has grown quite a bit, and is now 53 lbs and the picture of perfect health! He is the sweetest, funniest, and most playful "puppy" we have ever seen. Our family loves him so very much (well, almost all of us, our cat may have a different opinion! :-) He has been the perfect playmate for our boys. Thank you so much for our wonderful addition to our family. Shoot me an e-mail when ever you would like to see more pictures of Sunny. I love to show him off!!! I hope all is well with you and your family. It has been a while since we spoke, but I wanted to touch base with you and send you some pictures of our precious puppy, Dixie Doodle Dixon. We got Dixie in June last year from you guys and I believe she has her first birthday tomorrow! She is having a birthday party tomorrow night! I just wanted to let you know what a wonderful pet Dixie has been. She is an absolute nut and keeps us laughing all the time. She has graduated from two obedience classes and we plan to go through more with her as our schedule allows. Dixie is the friendliest dog we have ever met...she greets everyone with a giant wag of her tail (actually, her whole behind wags, not just her tail). We've never met a person she didn't like. She has been a star in obedience classes and at Puppy Play Days at our vet's office. She is the sweetest, most affectionate, and loving dog I have ever known. And she is like that to everyone, not just us. She has so much character and personality, I'd swear she was human. We couldn't be happier with her. Thank you for raising such a wonderful puppy...we are so blessed to have her in our family! I thought you might enjoy seeing some pictures of Dixie. The one entitled "NFH Ad" is an ad from Tom's business with Dixie as our model! We lost one tie to her mouth, but all in all it was a good photo shoot! Also, she was successfully spayed last October. Please feel free to call us if you have any questions . Again, thank you so much! We just love her to death! Just had Murphy's 8month birthday and wanted to send you an updated picture! She was spayed on Oct. 11 and has grown to be 45 lbs! I can't tell you how much we love her and each day we are happier than the day before with her! She has become not only a member of the family but our baby fill our empty nest syndrome! Murphy adores her daddy and can't wait until Tom gets home from work to go out and play. Saturdays and Sundays are extra special because she waits to go with us to get the morning papers and anything else from the store! We have completed basic obedience and she did very well with that. We then started her on Beginning Agility, but that was a little more tricky for her. She was able to complete the course without difficulty but was (and continues to be) very skiddish about suddent noises or new things. She did have fun with her new friends, though and enjoyed class just because she got to play with her best friend, Tess! Again, thank you for this angel and for breeding such an incredible pet! We are so very fortunate to have come across your website, and Murphy, when we did! Just wanted to send some updated pictures of Murphy! She just loves the snow! She is now approximately 53 lbs. of nothing but love! I can't tell you how much we adore this animal, but then again, I'm sure you have heard this about all of your dogs! Everything she does is so endearing to us. As Tom said, her eyelashes are incredibly long and it's the first thing everyonne notices about her- her little trademark. Don't know if you can see them, but if you notice a shadow, that's them! She is such a cuddler and needs to be near her family always, which is A-OK with us! When Tom told we can't go on vacation, what he really meant is we just don't want to leave her! Anyway, thank you again! If you have any pictures of her siblings we would love to see them! Please, feel free to forward these on to her littermates, too! We haven't updated you in a while about our beautiful girl, Murphy! She was from Chelsea and Cruiser's litter of March, 2005. Clearly, she doesn't realize she is a dog! As you can see, she has grown, but she is the perfect size! She has maintained a weight of 46 lbs. for the last several months, and our vet said she is "Awesome!" We love her more than we could have imagined!!! We've decided to keep her hair pretty trimmed as the winter brings with it LOADS of matts! It's amazing how much younger she looks with her hair cut, too! Behaviorally, she is excellent! She will chew random items that are left in her path, but it's only when she is bored and not surrounded by her family. (We may have created a problem, here.) I will often take her to school with me and she is quite well known amongst the staff and students! Everyone wants to know, "When is Murphy coming back to school?" Even when we walk her in our town, it's amazing the effect (and affect, too!) she has on total strangers! As always, thank you for breeding such a phenomenal dog!! I'm so tempted to apply for one of the available mini's that are left! Just wanted to update you on Murphy from New York! She is now 2 years and 5 months old, and was from Chelsea and Cruiser's litter of March 25, 2005. Murphy is a cool 46 lbs. and hasn't varied that weight in over a year! She is so lean and healthy but has a HUGE appetite for loving her family!!! We're curious if anyone else from her litter has had any trouble with yeast infections in their ears? Our Vet orignially thought it was a seasonal allergy that developed into a yeast infection for her, but we're wondering if it wasn't the homemade dog biscuits I was making for her. The biscuits had whole wheat flour, ground flaxseed, chicken boullion, rolled oats, honey and egg in them. Don't know what it could have been, but since her last antibiotic, she's been her usual awesome self! Do all Doodle owners get the same reaction when they walk these gorgeous creatures??? EVERYWHERE we go we are stopped at least three times and asked where we got her etc. More than a beautiful, cuddly, affectionate animal, she is just such a happy and loving dog! It seems like all she wants in the world is to be with her family, everything else is secondary, food included! Having owned a Lab before this, we find this MOST unusual!! I've said it before, but it bears saying again, THANK YOU for breeding such a wonderful dog who has brought us so much more than we ever could have imagined! A day without Murphy would truly be a day without sunshine! She is growing so fast, I can't believe it! She is very lively and she loves to play with other dogs. She discovered her shadow last night, she was trying hard to play with it! seconded only by an empty water bottle! She's smart, and very tricky. I have to really keep my eye on her. Last night she helped herself to some cake that was on it's way to a bridal shower! We're having a lot of fun together, and soon we'll start obedience school. Thanks for such a wonderful new friend! Hello, from Florida!!!! Just wanted to send you an update and let you know we look at your web site all the time. We just love Bella so much!!! We see her parents will be having more babies soon....sure is tempting!!!!! Bella will be getting spayed on Friday. Im not sure how much she weighs these days,but we will find out soon. I am guessing about 17 lbs. or so. We named our puppy Abbey and she is doing great!! We can't imagine our lives without her....we love her so much. we have been amazed at how smart she is. because she is 11+Ilbs and growing. to stop and ask what breed she is and how cute she is. not as cute as Abbey. being allowed to tear up paper! apart! I think they both still think about playing all the time! energy level of the owner with the dog! But we are definitely bonded! sitting in the shade of my truck. how to work with his energy level. I'm thinking he would love agility! Take Care and good wishes to you and your family. >him to two separate groomers and both just shaved him right down to a #3. >home and I am sending you this from work. Mini goldendoodles are the best thing since sliced bread! the class. Do you need a copy of her graduation certificate? usually take them to reach their adult size? Here is a recent picture of her. I just wanted to give you an update on Quincy, Cristie and Siscos pup. He is just over 7 months old now. He weighs about 35 pounds. He is a wonderful dog, we love him dearly. He was neutered 2 weeks ago and I was just wondering whether or not you need certification of that. Let me know if you need me to send you something. We are loving this puppy. Riley is just over 4 months and probably 15 pounds. She should double in size according to the vet. I have included some pictures from 11 weeks until today. She is in obedience puppy school and doing very well. She is studying the come, sit, off, down, stay commands and doing very well in remembering them. People are always stopping me and asking about her breed. She loves people and other dogs. We have made a good choice. The second and third were taken last Thursday ... at 17 weeks ... with our teddybear collection. Which one is Riley? Just wanted to send you an updated photo of Molly, our F1B doodle. Molly was the runt of the litter, born August 30th 2004. She is about 50 pounds of affectionate energy. We cant begin to tell you how much we love her, and how smart and loving she is to us. We moved to Stouffville last summer, into a home with a large bay window and huge fenced in backyard. She loves it out there, but we cant get her to come back in! Here she is in her favourite position in the front bay window where she sits/lays and watches the world go by (when she is not sleeping). Also, a close up of Molly with her bone. Thanks again for such an amazing companion. We just wanted to send a quick note with some updated pictures of our medium doodle Badger. She is almost 11 months now, and we just love her so much! She is a happy, energetic, sweet and affectionate dog. to get pats and attention from our neighbours. with her wonderful disposition and personality. Thanks for our great puppy! Here she is in the pictures showing off her new shorter hairdo. An update on our puppy. Tucker is high-spirited...definitely more aussie than poodle. We love her gobs. She was the highlight of the puppy training class at Pet Smart. Paul and I are avid gardeners which leads to another topic. Tucker's picture will be published in the big Washington state newspaper The Seattle Times(we will send you the link when it is published) the first Sunday in July, as the person who came to interview our garden, and the photographer who came to take pictures fell in love with our puppy. Jaimie-they constantly ask where we got her. The reporter actually got on line after meeting with us to find herself a miniture aussie doodle-and of course found nothing as special as Tucker. If you are not going to continue breeding..do you have a recommendation that we can give to the people with serious inqueries? They come often to us as the dog accompanies us anywhere dogs are allowed. Today we took her to a groomer as within two weeks her fur matted beyond our brushings. They shaved her...ohhhh...she looks aussie. Even the cat didn't recognize her, but I'm sure it feels good as our weather warms. Let me know about breeders of mini aussies-and I am truly sorry you are not breeding as we probably could have sold at least four at this point.